In waterfront towns and ports around the Great lakes and along our great western rivers, mariners celebrate the “End of Winter Lay-Up” – an event marking when the waterways are once again ice-free and mariners return to the sea or fresh waterways. Navy League members, their guests and the maritime employees of the carriers are invited to join us as we celebrate this fine maritime tradition! Bring your favorite maritime pictures of vessel in lay-up or iced-up and — the best of all — a sea story or two. 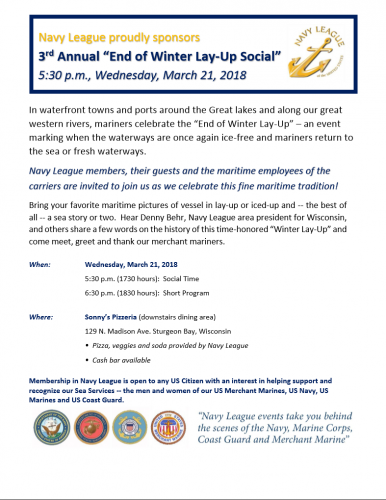 Hear Denny Behr, Navy League area president for Wisconsin, and others share a few words on the history of this time-honored “Winter Lay-Up” and come meet, greet and thank our merchant mariners. Membership in Navy League is open to any US Citizen with an interest in helping support and recognize our Sea Services — the men and women of our US Merchant Marines, US Navy, US Marines and US Coast Guard.